LIL HUSTLER TACKLE COMPANY WEBSITES collect information in ways similar to other websites. One way is to track which pages you visit using cookies, which allow us to improve the design and accessibility of the information on our website. The information collected includes the date and time a link was clicked, the amount of time spent on each page, the phrases typed in when searching the site, the zip codes and city/state combinations typed in when searching for retailers, etc. 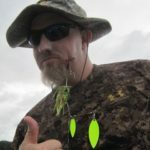 None of the information recorded in this manner is personally identifiable, and is used only to monitor usage and trends on the LIL HUSTLER TACKLE COMPANY websites. LIL HUSTLER TACKLE COMPANY will not ask for your Social Security number, or any other type of financial or sensitive identity information. If you receive an email that appears to have come from LIL HUSTLER TACKLE COMPANY that requests credit card or other financial or sensitive personal information, we recommend that you do not respond to it and that you do not use any links embedded in the email. If you have a question about an email that appears to have come from LIL HUSTLER TACKLE COMPANY, contact LIL HUSTLER TACKLE COMPANY by using the toll-free number on our Contact Us page, or by submitting an email on that page. LIL HUSTLER TACKLE COMPANY occasionally works with third parties for fulfillment of emails and mailings submitted for product registration, and for special offers users have elected to receive. Access to the information you submit is limited to select LIL HUSTLER TACKLE COMPANY employees and the fulfillment center that processes these mailings. We use reasonable precautions to keep the information you disclose to our website secure, and require confidentiality agreements with the parties we contract with. However, by creating an account within the LIL HUSTLER TACKLE COMPANY online store and providing registration information, you agree that we are not responsible for any breach of security or for the actions of these parties as long as we notify you if we believe a breach of security has occurred. By using the LIL HUSTLER TACKLE COMPANY website you give permission to collect information about the pages you visit as an anonymous user for the purpose of calculating aggregate site statistics. If you become a member of the LIL HUSTLER TACKLE COMPANY Community and register any LIL HUSTLER TACKLE COMPANY products, you authorize LIL HUSTLER TACKLE COMPANY to use information you provide to personalize the information we deliver to you and to use your demographic information when calculating aggregate customer data. All email and mailing lists (subscriptions) are joined on an opt-in basis, and the member has full control of all subscriptions through their personal profile page.